DES MOINES – The Iowa Barnstormers have signed defensive lineman Reggie McGee to the 2019 roster, Head Coach Dixie Wooten announced today. 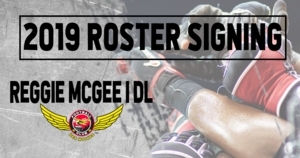 McGee (6-2, 240, Ball State University) joins the Iowa Barnstormers for his rookie season in the Indoor Football League (IFL). Collegiately McGee began his career at Hartnell Junior College before transferring to Ball State University in 2016. During his two years with the Cardinals, McGee appeared in 22 games collecting 17 total tackles and one tackle for loss. Season Tickets for the Iowa Barnstormers 2019 season are available now! For as low as $80 per seat, fans can cheer on the United Bowl Champions from the same great seat location each game. For more information, call the Barnstormers at (515) 633-2255 or log on to www.theiowabarnstormers.com.